AMARANTHE Release Video For "That Song"
AMARANTHE have dropped the video for their latest single "That Song" from their epic and gloriously over-the-top new album Maximalism. Their record is out October 21st on Spinefarm Records and finds the band further expanding its pop x metal hybrid style. 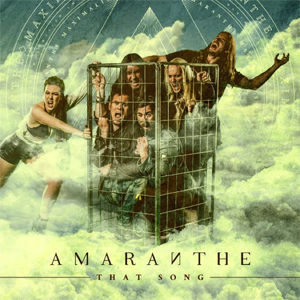 The album is full of songs so catchy that they embed themselves in your brain for hours and "That Song" is easily one of the most memorable AMARANTHE songs to date. The band has this to say. "What song? 'THAT song'! Our very first single and video from our brand new album Maximalism is now out! Representing a fresh and new take on the AMARANTHE sound, it is part of the wide spectrum of the diversity that is Maximalism. The video represents the struggle that comes with following your dreams no matter the costs. Even if you are on the downside of life, one day there will be a turning point when it all becomes clear - to the sound of "That Song"." The clip was directed by fellow Swede Patric Ullaeus and features high-energy visuals that mix a gripping narrative with performance footage. The storyline finds the members of the band playing a variety of roles as musicians in blue-collar gigs at the crossroads in their lives. Watch it on KNAC.COM right HERE.